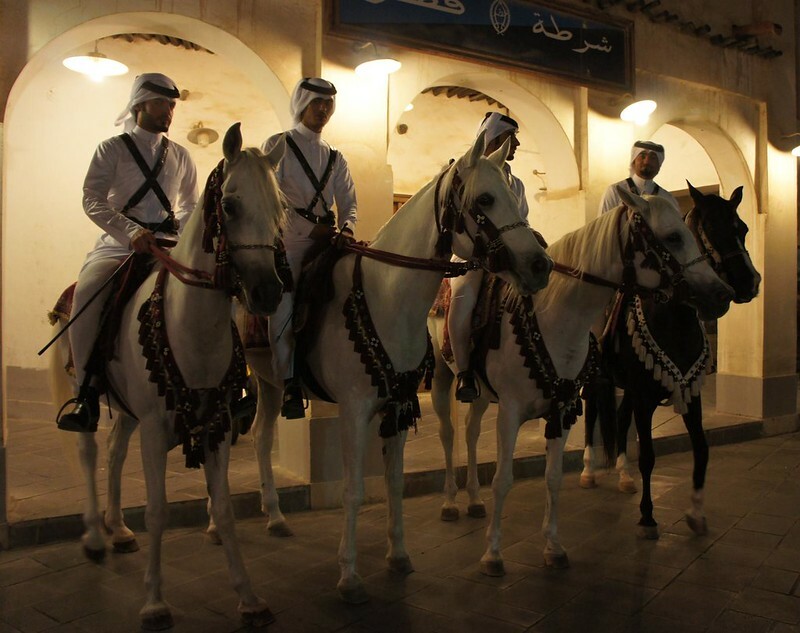 Confession: these photos are all from my trip to Qatar last November. I only just edited and uploaded them. I hope that does not make them any less interesting. 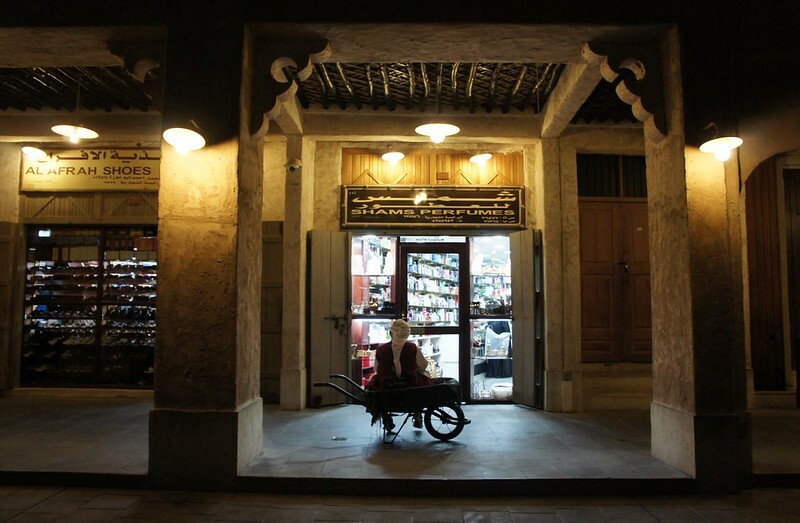 Souq Waqif in downtown Doha was built on the site of a historical market but everything now seen is a recent fabrication. A lot of effort has been taken to create the faux heritage feel of the place. 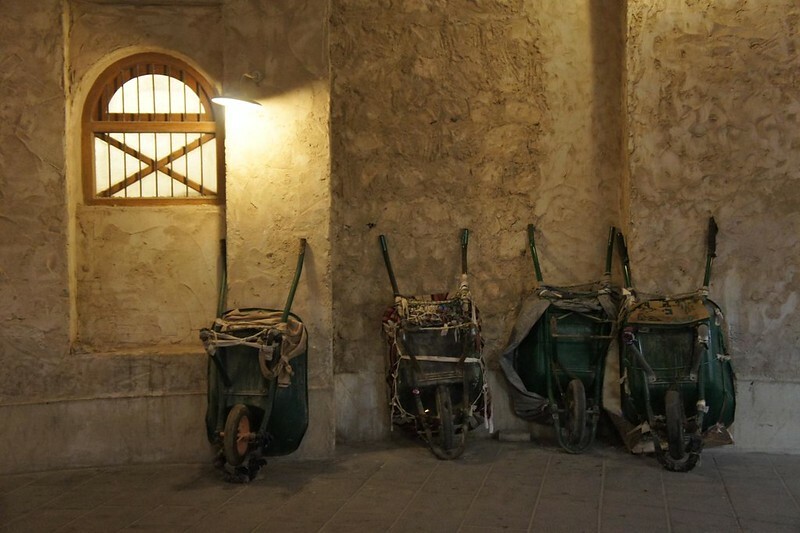 Unlike many of the places I visited in Doha, the souq is well attended by many different kinds of people: locals, expat residents and tourists. There is a good atmosphere. 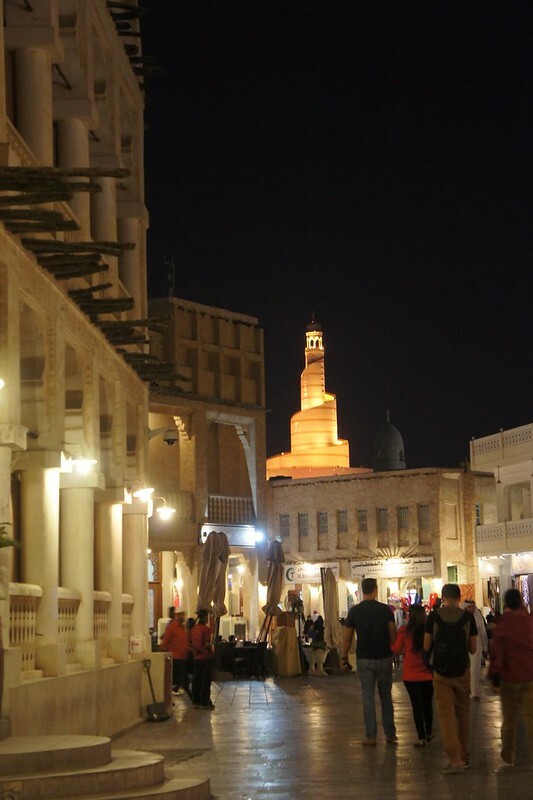 I ended up at the souq three times during my week in Qatar. 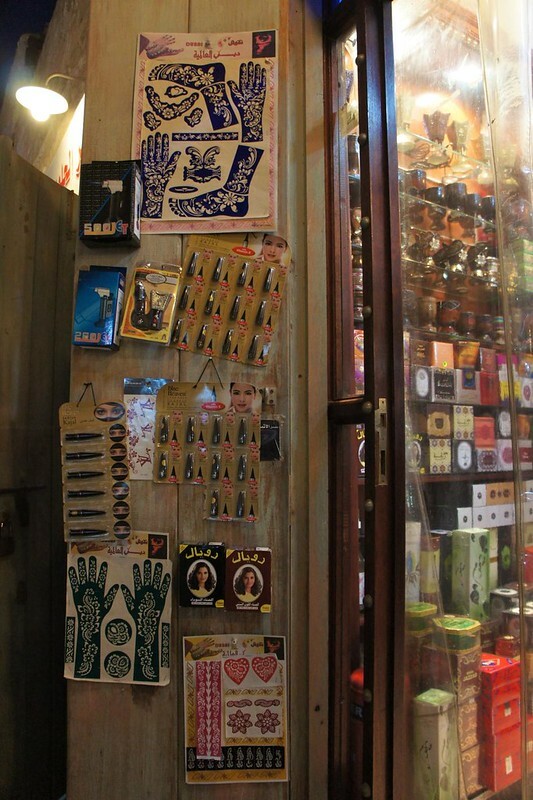 1: Make-up, henna and perfumes for sale. I am mad at myself for not buying one of these tubes of Gulf-style kohl. I am the very worst at applying eye make-up but I have never tried this kind. 2: Plenty of black abaya and shayla, each with a unique motif. 1: For all your Qatar pride needs. 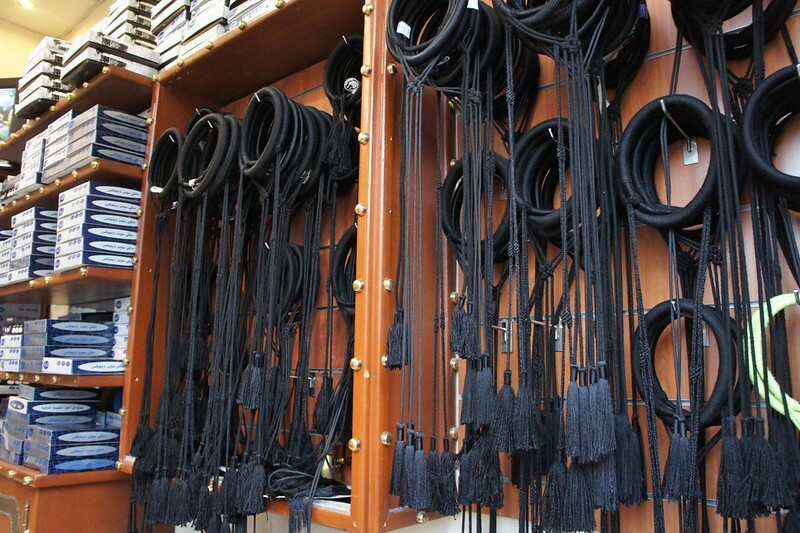 2: A selection of agal, the fringed cord men wear over their ghutrah headdress. 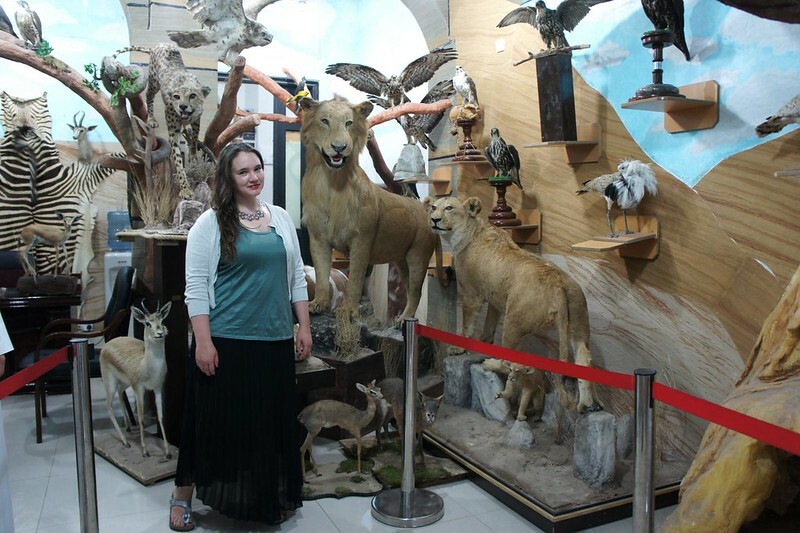 I could hardly believe the display at this taxidermy shop. The shop keeper said I was welcome to take a photo, then he insisted on taking mine too. This is my "everyone is dead" face. 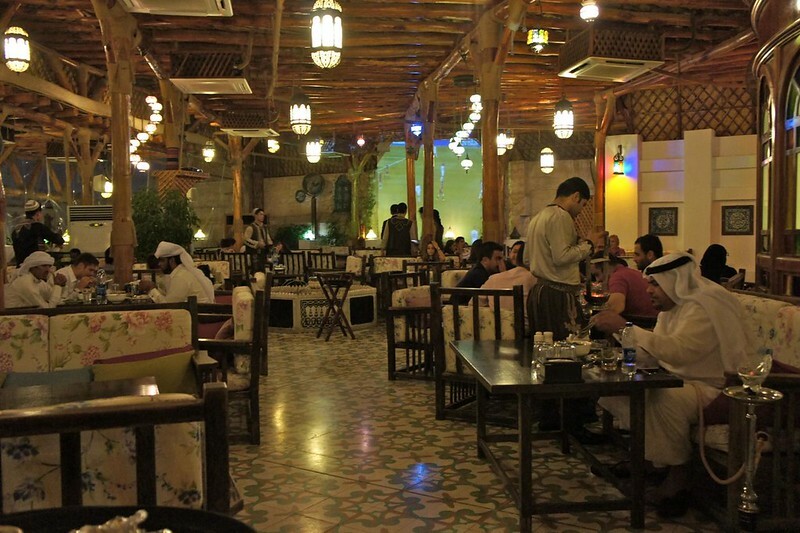 My cousin and her family took me to Damasca Restaurant in the souq for a Syrian-fusion meal. 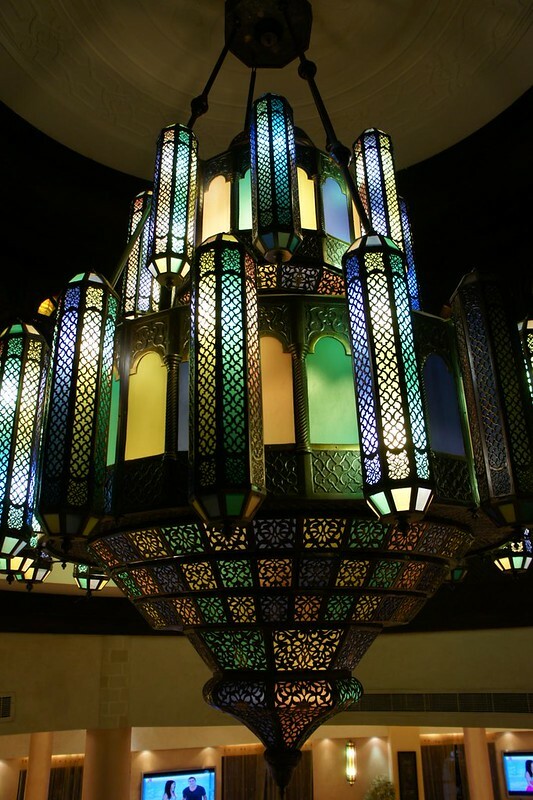 The restaurant has an appealing vintage Damascus theme, with this enormous lantern hanging at the centre of a curved staircase. One thing I really wanted to get for myself in Qatar was a silver necklace with my name in Arabic. 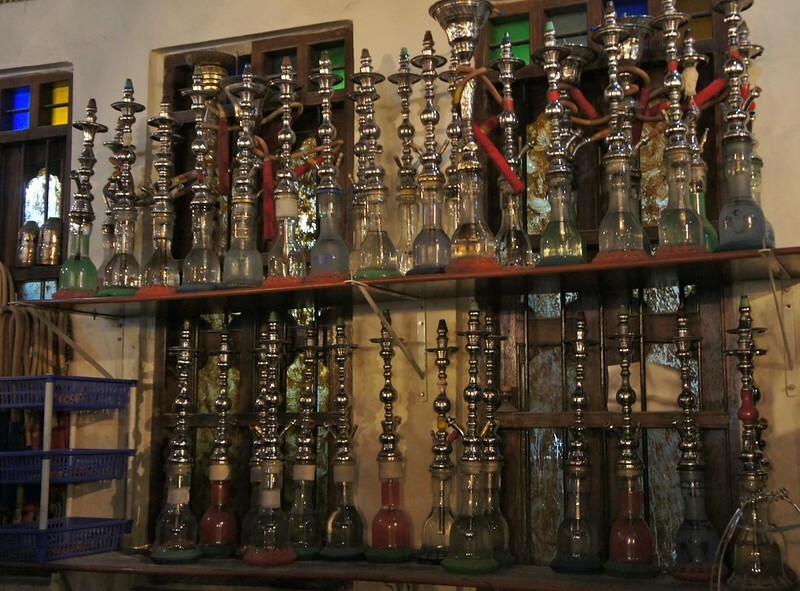 I had heard that these could be made to order within a couple of days at the Gold Souq. 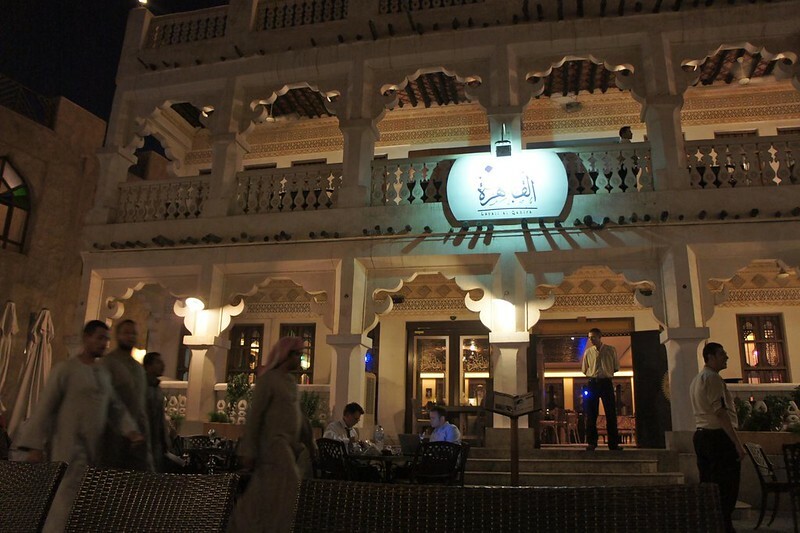 Next to Souq Waqif, I saw a large building with the lettering 'New Gold Souq'. Inside was this fresh, modern collection of jewelry stores. There was almost nobody in there. This was not at all what I had expected from the Gold Souq. I did not find a jeweler who could make the necklace I wanted. 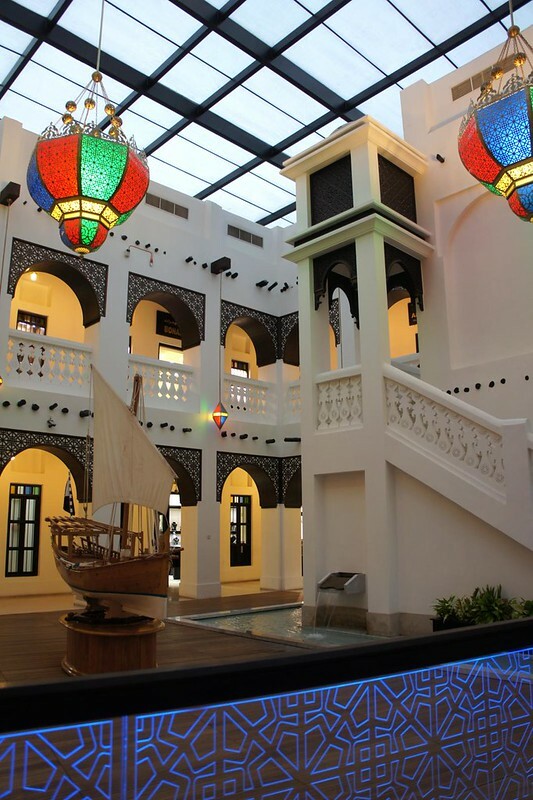 It turned out that the New Gold Souq is a completely different place from the actual Gold Souq. There were plenty of shoppers here - it seems that South Asian workers like to take home their earnings in the form of extremely elabourate gold jewelry and there is a whole district to serve that need. 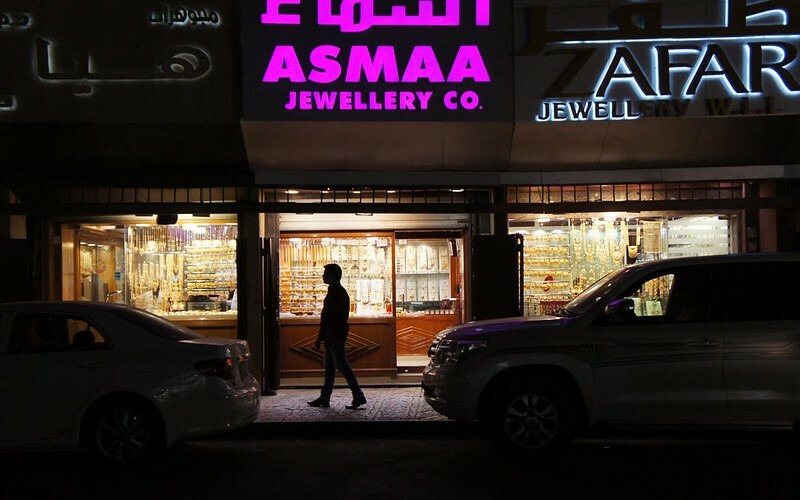 The New Gold Souq is gleaming and immaculate, just for tourists, while the Gold Souq is several blocks away in an area of collapsed sidewalks and decidedly less polish. It was still a lot of fun to walk around with my cousin and look at the golden creations. This was on my last night in Qatar, unfortunately, so it was too late to custom order a nameplate necklace. When I was out for the day on my own, I was desperately searching the market for a public phone so that I could call my cousin to let her know where I was. 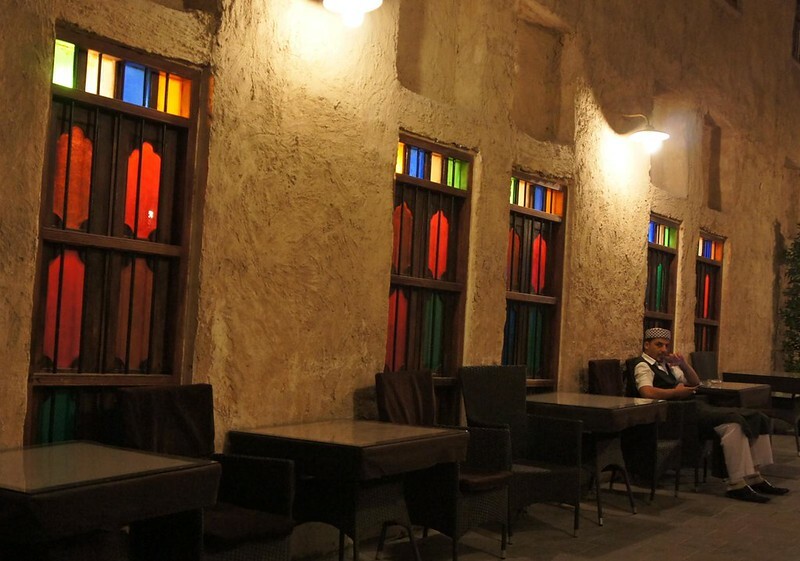 I decided to try the Souq Waqif Information and Tourism Centre, thinking there would be a visitor courtesy phone or I could be given directions to a pay phone. This is a very reasonable assumption to make from a tourism district information office. Me to staff: "Hello, could you tell me if there is a public phone in the Souq?" Staff: "You don't have a local SIM?" "No, I'm just a tourist." "You need to buy a local SIM." "I only need to make one quick local call. Is there anyplace in the market with a public phone, or anyone that would let me make one call?" "No. You need to buy a local SIM." Meanwhile, there were three telephones sitting idle on the desk between us as we spoke. There was no flicker of understanding from the staff that not all tourists buy a SIM card while on a short holiday. The lack of public pay phones anywhere in the market is maybe more related to the fact that no Qatari would ever use one. 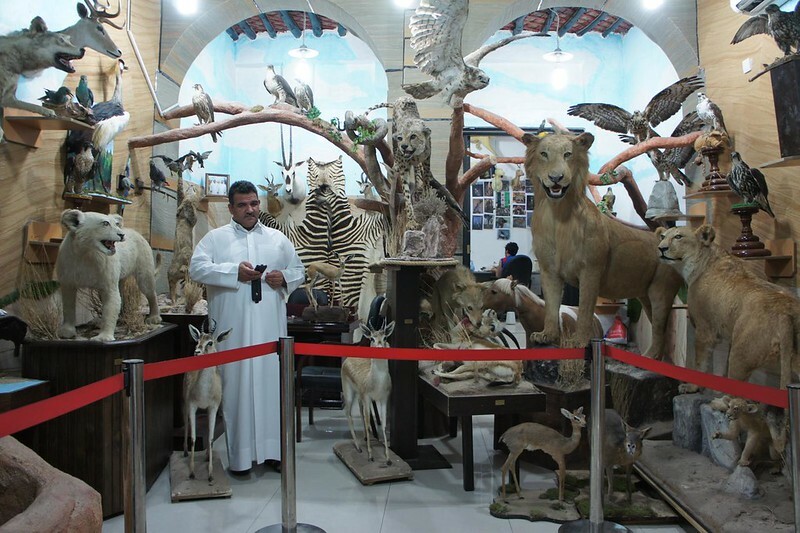 I know Qatar is on a push to become a tourist destination but this kind of encounter shows that there's still a way to go to understand the needs of short-term visitors. 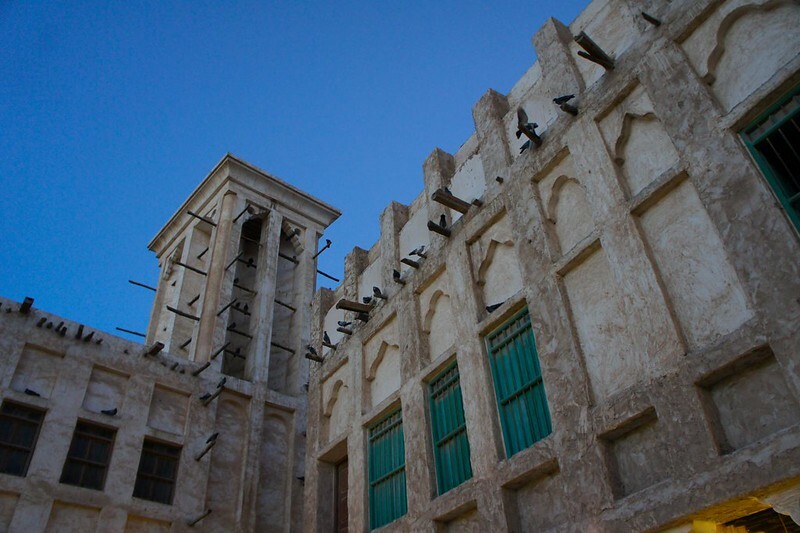 Coming soon: pics and report from my visit to the Falcon Souq.